The weather was terrible in Marudi. When it rains it just pours. 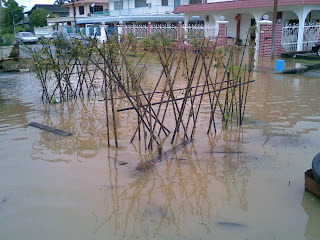 The few days before our return to KL, it rained continuously. I was a bit worried as we had to take the small flight out to Miri International Airport. Flood waters kept rising and at the time when we were leaving, Jon’s brother took out the boat in case, vehicles and the chooks were moved to higher ground, as the water level reached the tip of the driveway. 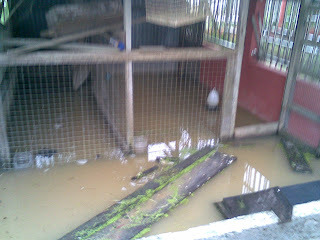 When we arrived home, updates from Marudi revealed that the water level continued to rise until Jon's house living room. They had made preparations by propping up all the furniture by 1 feet. 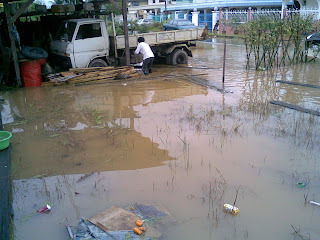 Thank God the rain did finally stop and the water started to subside within a week. I was worried the water was going to destroy MIL's noodle machines but all turned out well. 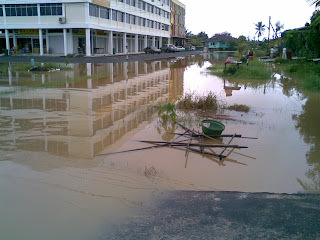 Now I know how much havoc flooding can cause. Jon’s mum is one very tough entrepreneur and that’s probably where Jon inherited his entrepreneurial instincts. She runs her own noodle business, rears chooks and vegetables for sale as well as for own consumption. 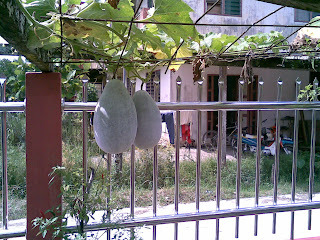 Here are some pics of her produce. 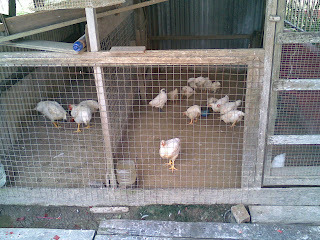 Her kampong chooks are really tasty though the meat can be quite tough. 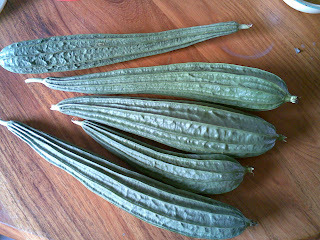 Each year there would be something strange to eat when we are back at Marudi. Last year we had barbequed wild boar on arrival. It was tough but quite yummy with chilli of course. Arielle had frog porridge. My MIL put it in her porridge so that she can move fast. She sure can…she runs not walk! 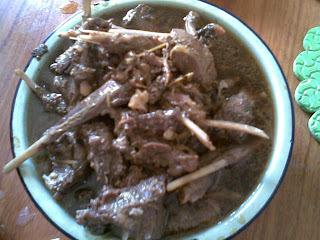 This year on arrival we had turtle soup for dinner and a few days later had wild bats cooked with ginger and black sauce. Yucks eh? Jon’s brother hunts and shot a couple of wild bats. Tasted like mutton but the thought of eating the furry creatures just irks me so I did not touch the dish much. Here is a pic of the bat dish..din take the turtle one.. Babies are helpless and they totally rely on parents to do things for them. What we decide to do have huge impact on them. They are practically at our mercy. Aaron has recently turned 6 mths and so I thot it was time for him to start his infant cereal. 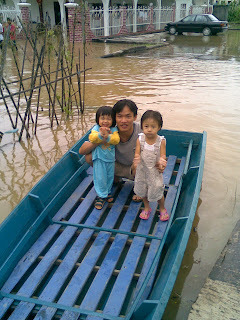 Since he was sick when we came back fr Marudi, I gave him one week break and decided to start him on Monday 9/2/09. He seemed to be enjoying it. Gave him a bath after an hour and then decided to put him to sleep with 5 oz of EBM. He finished his EBM and I left him in his room to give Arielle a bath. When I finished with Arielle I heard him crying and found that he has vomited all over the mattress and his head had some of it when he rolled over it. I thot it was one of those things. I started to clean up but then he vomited again. Over the 2 hour period, he vomited non-stop and it was real pain to see his body go into spasm before each vomit. Jon & I took turns to call each other for help each time it happened. The final spasm came with nothing coming out, so we knew his stomach has been emptied. He was so tired after that I just held him in my arms and he slept. After that he drank ok..next day, he started to have green stuff coming out of his eyes and my mum then informed that he started a bit of diarrhea. After work, took him to the dr’s straight. His throat was red and that probably caused the nasal track to be infected. After some probiotics and eye drops he seems to be better. I really do not know what happened there. I shld hv listened to my mum, i.e. not to rush hin into cereal since he was recovering from HFM. Maybe he was allergic to the cereal with milk as all this time he has been on breast milk. Hmm..but when he was 1 mth he was fed formula milk also. Maybe he was overfed. Too much starchy cereal and then EBM. My mum seems to think I overfed him. What do you think? All these stuff happening to Aaron just dampens my mood. He is such a cutie and I put him thru such an episode. Sorry Aaron, mama’s fault. On a happier note..he can now sit up, crawl and is very inquisitive. I must say he is really a cute baby. CNY this year was far from expectations and very hectic. We took the 7 am flight from KL to Miri on 24 Jan and only started packing late the night before. I wanted packing this year to be different i.e. to pack way in advance but was busy every night. The Wee family got together and had our reunion on 22 Jan and on 23 Jan night, my brothers wanted to see the kids again, so stayed at my parents’ house till late. As usual Jon was working late..its always like that when we are off somewhere the next day. So in the end, only took out the suitcase at 11.30 pm. We hardly slept. By the time we got to bed was 2 am and Jon’s friend came at 4.30 am. I only got ready by 5 am. So stressful! Well I din know that more stress to come. 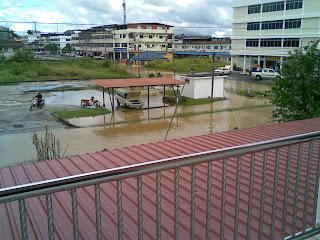 Arrived at Marudi about 3 pm. Felt very unsettled with the kids. 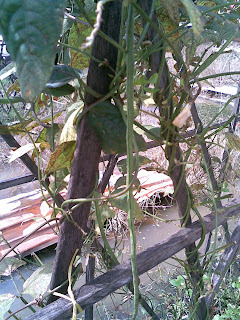 The weather was terrible, worst than before, so hot and humid on one hand and rainy in the next. Mosquitoes were huge and I had at least 15 bites on the first nite. Was worried more for the kids. I hung around them so that the mossies will attack me instead of them as my blood is the sweetest and prone to all such bites. I was really irritable and poor Jon got the brunt of most of it but I guess he patiently ‘tahan’ me. Our little Aaron then had fever on 4th day of new year. Took him to the government hospital and got some fever medication. At 3 – 4 am that nite, we found rashes all over his front part of the body. Took him to the hospital again in the morning. The initial diagnosis by a nurse was measles. The doctor’s assistant said no..its an allergy. It was a relief to hear that. It cannot be anything so serious as normally fever will continue up to 2 – 3 days. The rash was almost immediate. Then blisters started appearing on his little toes at night..wah panic and I was suspecting hands, foot & mouth disease already. 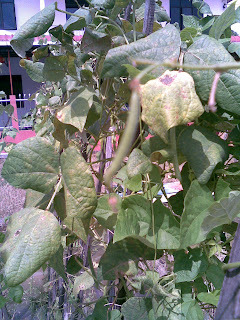 Searched the net and the signs matched, blisters appearing after 1 day of fever. He refused to drink and was unsettled. Jon & I took turns at nite to comfort him. Each waking hour was a crying one. Sat morning back to the hospital again..the episode at the hospital require another write up…Arielle developed fever on Friday nite. By now I really could not wait to go home. My mission was to just keep their fever down. Booked an appointment with SJMC for Monday morn. Touched down at 7 pm on Sunday, 1 Feb, reached home before 8 pm to a clean house. Mum mopped the house and Dad fried mee hoon for our dinner. Thanks ma & pa! Home Sweet Home! Monday morning – confirmed Hands, Foot & Mouth Disease – the Sarawak strain – and both quarantined for a wk! Thank God not the serious strain. But got it fr my parents who told me earlier not to bring him back. Sigh! I am City Girl married to a Kampung Boy living in the City!